The mighty River Tay has the greatest flow of any river in The British Isles. It is awash with character, as you might expect from the stunning geography it traces. There are quiet contemplative pools, rich rolling farmlands, soft wildflower banks, and ancient mature trees in some sections, as well as thunderous, deafening rushes of water, and steep sided rock formations by contrast in others. It is often a privilege to be a part of this ancient scenery, whether or not any fish result from efforts made therein! 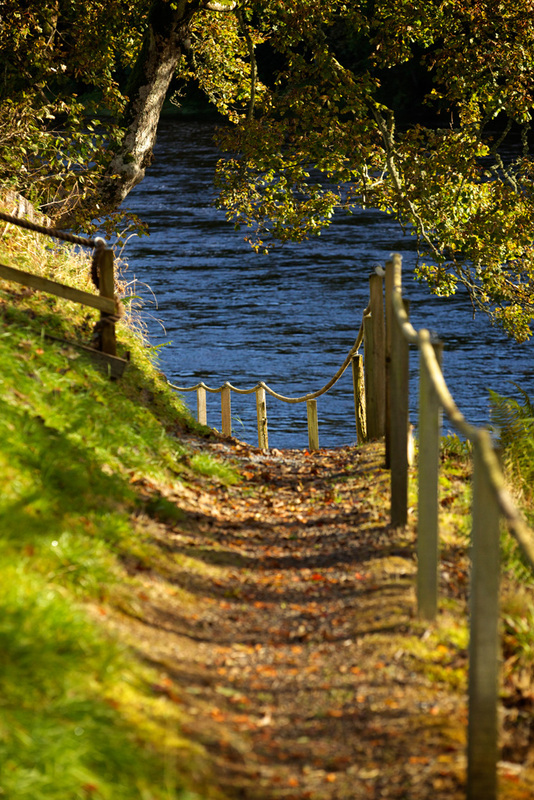 The two beats at Taymount, Upper and Lower, will be well-known to many anglers who have sought their luck from both boat and bank in this particularly beautiful stretch of The Tay. This area will need no introduction to for those who have driven down the long leafy drive towards Taymount House and meandered downhill to the breathtaking view of the Campsie Linn. The sound of water gushing through Campsie Linn can be heard from Taymount House as the entire weight of water in The River Tay is forced through a narrow rock formation and into the famous swirling Linn pool below. Taymount House sits in a heavenly position above to hear and see the ensuing drama- surely one of the most awe-inspiring experiences nature has to offer along the entire length of the river. It is little wonder that the ancient peoples of Scotland looked at these theatrical spots as spiritually significant. Taymount Estate has been in the Murray family since 1725. Taymount House is at the heart of the estate and is flanked by two properties, West House and Gardener’s Cottage. Owner John Murray Lindsay and his wife have recently fully refurbished these two cottages, each of which sleeps 6, to provide well-appointed self-catering accommodation for fisher-folk, and other visitors to the area. Mindful of the sporting guests’ need for hot water after a long days’ fishing, these cottages provide plenty of home comforts whilst still retaining all the charm of historic estate cottages. The properties can be taken separately or together, sleeping parties of up to 12, with plenty of parking space and a private walkway directly to Campsie Linn. They are both available for booking immediately. The fishing community will be interested to know that Taymount House is undergoing a similar refurbishment, and will be available to let from September 2013. Taymount House sleeps 14. When taken with West House and Gardener’s Cottage the entire accommodation comfortably sleeps 26. Taymount House would be a glorious property in any situation, but placed where it is, this house is perfectly placed for people who wish to enjoy the benefits of the river in the most elegant possible surrounds. The south facing drawing room overlooks the river and is particularly magnificent for early evening drinks, before settling down for dinner in the oak panelled dining room. Even the gardens at Taymount House are a treat to behold including a private tennis court, Victorian walled garden and pathway directly to the river. If you would like to book a stay at Taymount House, West House or Gardener’s Cottage please contact John Murray Lindsay on 07909 66 22 36, or visit the website www.taymountestate.com.